This is good for one player at the ​RML Specialty Hospital Annual Golf Tournament. This is good for two players at the ​RML Specialty Hospital Annual Golf Tournament. This is good for three players at the ​RML Specialty Hospital Annual Golf Tournament. 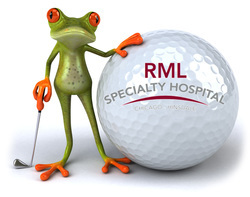 This is good for four players at the ​RML Specialty Hospital Annual Golf Tournament. Don't Forget to add on a Sponsorship Opportunity!